A view of the Milky Way, from the European spacecraft known as Gaia. Wednesday was the day astronomers said goodbye to the old Milky Way they had known and loved and hello to a new view of our home galaxy. A European Space Agency mission called Gaia just released a long-awaited treasure trove of data: precise measurements of 1.7 billion stars. It's unprecedented for scientists to know the exact brightness, distances, motions and colors of more than a billion stars. The information will yield the best three-dimensional map of our galaxy ever. "This is a very big deal. I've been working on trying to understand the Milky Way and the formation of the Milky Way for a large fraction of my scientific career, and the amount of information this is revealing in some sense is thousands or even hundreds of thousands of times larger than any amount of information we've had previously," said David Hogg, an astrophysicist at New York University and the Flatiron Institute. "We're really talking about an immense change to our knowledge about the Milky Way." For 7 million stars, Gaia even has measurements showing their velocity as they move toward or away from the spacecraft. 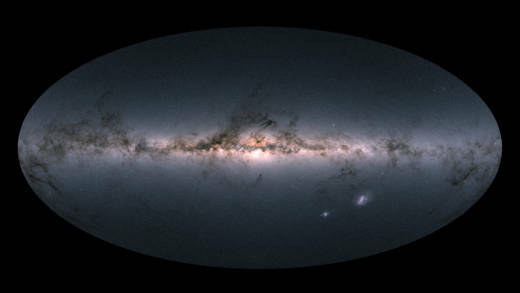 "This is just a fantastic new addition," said Anthony Brown of the Netherlands' Leiden University, with the Gaia Data Processing and Analysis Consortium. In 2016, Gaia released some initial results but that was just a tease compared with Wednesday's massive data dump. Astronomers around the world have been planning how to attack it for months, knowing that discoveries are just waiting in there for the taking. "Enjoy it," Antonella Vallenari, another member of the consortium from the Astronomical Observatory of Padua in Italy, said at a news conference as she announced that the data was becoming available. Scientists around the world who were watching the event online struggled to take it all in. "This is like massive scientific progress and we were blinked an image," said Jackie Faherty, an astronomer at the American Museum of Natural History, one of more than a dozen astronomers who woke up before dawn and gathered together at the Flatiron Institute in New York City to watch. Then it was time to play, as the scientists bent their heads over their laptops and tried to download data. Researchers are expecting a slew of discoveries in the coming hours and days, but analyses will go on for years and even decades. "This is the data we're going to be working on for the rest of my career. Probably no data set will rival this," Faherty said. "It's the excitement of the day that we see it. It's why we were up at 5 a.m. to get here. It's exciting to be around each other and trying to get the data all at once. It's a day we're going to remember."